Racing, it seems, has become what external detractors have long said it is; corporate PR reps going around in circles. Put all that on top of shrill television coverage which pays more allegiance to Fortune 500 stockholders than Daytona 500 fans, that places selling over racing and, especially, over intelligent reportage, and you get the kind of anger among fans that make for the vitriolic commentary that pigtails many online racing stories. In mid-Novembers past, auto racing championship runs were often downright delicious. This year; grandma, pass the gruel. Perhaps that is why the one fleck of flavor hiding in there among the beets and lima beans is being greeted with massive meh. 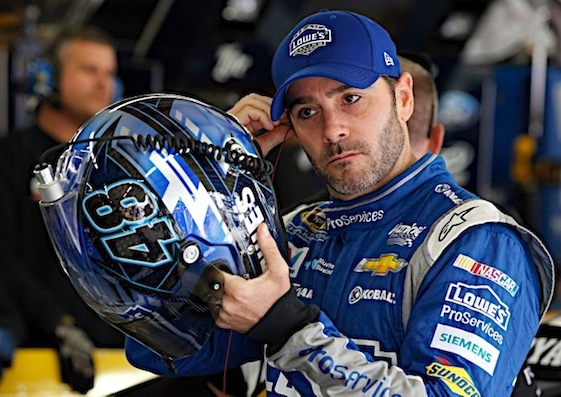 Jimmie Johnson is one good finish away from making history. And not just any history. If Johnson finishes ahead of fellow Chasers Joey Logano, Carl Edwards and Kyle Busch this weekend in the Sprint Cup season finale at Homestead-Miami Speedway, he will become the third driver to win six series championships. And the two drivers are your biggest of big boys: first-ballot Hall of Famers Richard Petty and Dale Earnhardt. So where’s the love? Where’s the excitement? Where’s Jimmie? Hello; is this thing on? Johnson has a solid chance this weekend to become driver No. 3 on NASCAR’s Mount Rushmore. He has the total respect in the race shops and garages. He’s fashioned what is by far the greatest resume since Big E.
But those same attributes should produce more of a pop for him in the media this fall, one would think. The guy should be getting LeBron kind of props. He’s not even getting Chris Paul kind of coverage. Even Johnson’s own series seems cool toward his run for seven. Every race weekend, NASCAR selects a small handful of drivers to conduct pressers in track media centers. Presumably, the drives selected represent appealing storylines. Like at Kansas last month, localish drivers Carl Edwards and Clint Bowyer were brought into the media center. Yes, as was Johnson. But two weeks ago at Texas, which was one week after Johnson secured his place in the final four and had nailed his shot to win No. 7 by winning at Martinsville, no Jimmie. RacinToday.com colleague John Sturbin quickly phoned that tidbit in with a large amount of WTF in his voice. Johnson, obviously, was at the Championship 4 presser this week, but again, there just seemed to be no buzz around him. For reason’s mentioned here and for so many, many more reasons, NASCAR’s popularity is skidding. Grandstand seats are embarrassingly empty and TV numbers stink. You would think that prospect of huge history being made this week would make the needle jump. Johnson himself gave a less than electric answer when asked about if he felt he belonged with Petty and Earnhardt at the top of the heap. Is it the sport? The driver? The media? Society as a whole? Probably all are playing a factor and that’s a shame. This weekend, Johnson may take a huge step toward becoming American sports’ biggest stories. But there is no guarantee that next week, his story will run downpage from pro thug Conor McGregor going nutso at some disgusting press conference at some grubby casino.